The word “Soundscape” is a term coined by the composer and writer R. Murray Schafer which means our ever-present sonic environment. Through history this soundscape has continued to increase in complexity as the world of the post-industrial revolution continues to evolve. As our awareness concerning the dangers of toxic waste and environmental pollution grows, there is however a lack of awareness concerning the ever-increasing pollution of our sonic environment. 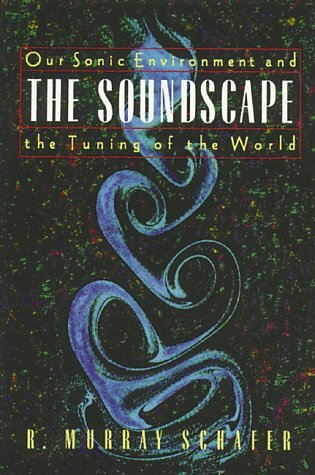 In his book “The Soundscape – Our Sonic Environment and the Tuning of the World” Schafer brings attention to the importance of discerning between different kinds of sound; the ones that enrich us contributing in the creation of healthy environments and the ones which acts as sonic polluters. According to Schafer there are two solutions to the problem of noise pollution: the development of an aurally aware culture with a high degree of sonological competence where children would be exposed to “ear cleaning exercises” at an early age, or a worldwide energy crisis where the destruction of technology ( the current main supplier of noise) would effectively eliminate the problem. A must-read for anyone concerned with our acoustic environment, both past and present, and what it might become in the future..